BBQ RESCUES! Foundation Launches First California Fundraiser on Memorial Day Weekend at the Urban Press Winery in Burbank, CA. Chef Mick Brown of the BBQ RESCUES Foundation seen with pop sensation Redfoo of group LMFAO (“Party Rock Anthem”) fame. The Foundation was challenged to create a Vegan BBQ Menu for the star and his family’s Thanksgiving Dinner. Pictured Dish- Smoked Sweet Potato/Rainbow Carrot Mash with Mint and Smoked Coconut Flakes. To end out 2017, the BBQ RESCUES! Foundation was active with Social Media outreach to promote Fitness and Healthier Grilling, as well as participate other important Community Projects. We traveled from Arizona, to Palm Springs and spent Christmas Eve handing out hundreds of Holiday Salads to the Homeless on Skid Row in Los Angeles. Here are some Highlights of our Activities. Check back soon for Updates. Promotional sign for Fraternal Order of Eagles BBQ fundraiser to benefit the Agape House of Prescott in Prescott, AZ. Chef Mick Brown made appearance at Fundraiser in Prescott, Arizona to promote Healthy Grilling and support the Fraternal Order of Eagles’ efforts to help Agape House of Prescott in their mission to serve the Homeless. Chef Mick Brown of the BBQ RESCUES! Foundation, meets with Volunteers to tour the Historic Elks Theatre in Prescott, Arizona. Met with Staff at historic Elks Theatre and Performing Arts Center. Agreed to work on bringing “Broadway to Prescott” benefit to support local youth charities, and serve Healthy Gourmet BBQ to Supporters. Creative Warning Sign at the Farm at South Mountain in Phoenix, where they specialize in fresh Farm-to-Table Cuisine, including BBQ! Chef Mick Brown at the Farm at South Mountain in Phoenix. Hoping to hitchhike ride in old Pick-up. Met with staff at The Farm at South Mountain in Phoenix, Az. Along with tasting some amazing food from their Grill, we agreed to come back sometime for a workshop to teach Phoenix how to smoke the nuts from their Pecan Trees. Caught last year of Hard Rock Hotel Palm Springs. Chef Mick Brown with poolside Grill Master. Talked with Executive Chefs at Hard Rock Hotel in Palm Springs about doing a poolside “Bikini BBQ” fundraiser. Unfortunately, the resort closed before we could make it happen. Did healthy Spooky Grilled Shrimp Video sponsored by Luvafoodie.com. Has over 55,000 views to date. Chef Mick Brown at We Can Survive 2017 concert to benefit the American Cancer Society. Attended We Can Survive concert to benefit the Breast Cancer Awareness. Enjoyed Demi Lovato, Nick Jonas, Sam Smith, The Weekend and surprise act Rihanna. Chef Mick Brown in “BBQ and Politics Don’t Mix” by Naheedence Studios. Released iconic “BBQ and Politics Don’t Mix” Photos courtesy of Naheedence Photography. Chef Mick Brown with Ted Talk Speaker and Reinvent Yourself motivational coach Sahar Andrade. Attended first “Dream and Brainstorm Together” workshop with expert motivational coach (and Ted Talk Speaker) Sahar Andrade in Burbank, CA. Chef Mick Brown with Mark Casanova and Stephany Campos of Homeless Healthcare LA. Thanksgiving 2017. Foundation donated services to prepare Thanksgiving Turkeys, Stuffing and Vegan Glazed Yellow Squash & Veggies for Homeless Healthcare LA Holiday Party for Staff. Vegan Thanksgiving 2017 dishes prepared by Chef Mick Brown of the BBQ RESCUES Foundation for pop star Redfoo and Family. Smoky Rainbow Carrot & Sweet Potato Mash with Mint, Coconut and Grilled Veggie Mixed Greens with Kale. Foundation answered challenge to demo Vegan Thanksgiving dishes for pop star Redfoo . and Family. Chef Mick Brown with Hawaiian Dancers at 2017 Island Beer and Food Fest in San Diego, CA. Promoted Foundation and Healthier BBQ at 2017 Island Beer and Food Fest in San Diego, CA. Discovered Simon’s Cafe and Catering in San Diego. One of the highlights of national food tour. They do Charity and Grill Veggies! Released the first nutritious White Asparagus Mac N Cheese video on Youtube. Volunteers at Los Angeles Mission’s Holiday Luncheon 2017. Promoted LA Mission’s annual Holiday Luncheon. Hope to be invited to participate more next year. BBQ RESCUES! Foundation’s Los Angeles Volunteers preparing Christmas Eve Grilled Salads for the Homeless on Skid Row, Downtown LA December 2017. Pictured: Actress Jackey Hall, Aaron Collins, Rachel Milstein. BBQ RESCUES! Foundation’s Grilled Veggie Salad with Smoked Ham. BBQ RESCUES! Foundation’s Grilled Veggie Salad with Smoked Ham. Handed out hundreds to people on Skid Row on Christmas Eve 2017. Chef Mick Brown of BBQ RESCUES Foundation with Lani Dapolani and Volunteers of HBNH (Homeless But Not Helpless) Ministries passing out Salads Christmas Eve 2017, Downtown Los Angeles. 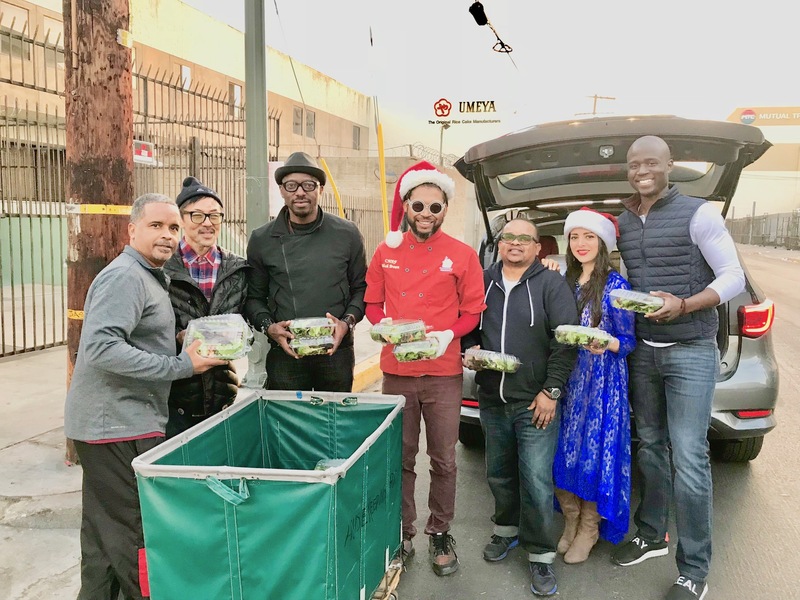 Foundation donated nearly 300 Salads to Homeless people on Skid Row, Christmas Eve 2017. Others necessities also passed out by Lani Dapolani, founder of HBNH (Homeless But Not Helpless) Ministries and the LA Mission. Stay Tuned For Exciting 2018 Updates! Some people may just call it Smoked Whitefish and Lox or Salmon. Here at BBQ RESCUES, we consider it Kosher BBQ. 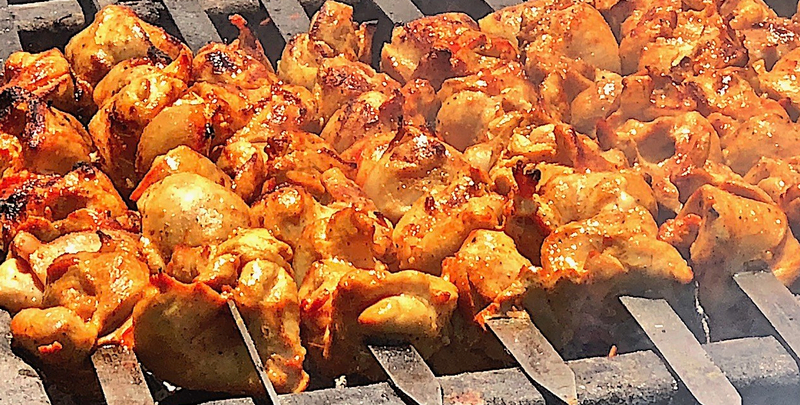 Where can you find the Kosher BBQ in Los Angeles? If anyone has any favorites, feel to add them to our Comments below. On June 10, 2018, I was honored to be invited to the 26th Annual Breakfast Meeting at Congregation Bais Naftoli in Los Angeles. Along with Congregation President, the event was attended by high ranking city, county and federal officials. Check below for an online printable version of the Kosher Recipe handouts prepared by the BBQ RESCUES! Foundation. Feel free to reprint and share alike. Was a true pleasure to meet Andrew Friedman, President of Congregation Bais Naftoli in Los Angeles. For the Breakfast, they served delicious Scrambled Eggs, Lox Salmon, Smoked Whitefish, Banana Blintzes, as well as was an abundances of Salad, Bagels, Cream Cheese and Fresh Fruits (& Veggies). My favorite was chomping on the Blueberries that were refreshing and in season, among other dishes. Fresh Fruit served at Congregation Bais Naftoli 26th Annual Breakfast in Los Angeles. After the Breakfast, I attended to a meeting at the West Los Angeles Farmer’s Market. Upon leaving, I couldn’t resist the unmistakable aroma of smoking BBQ. Venturing a bit further down Santa Monica Bl., was surprised to stumble upon my first ever Kosher Street BBQ at Santa Monica Kosher Market. A Coincidence? After having just prepared flyers on the subject? Who knows… Will say I was impressed to not have to request Fresh Veggies from the Grill. They already had me covered. Grilled Veggies at Santa Monica Kosher Market “Tasty BBQ Sundays”. Sunday Kosher BBQ Chicken at Santa Monica Kosher Market in West Los Angeles. Sign at Santa Monica Kosher Market advertises “Tasty BBQ” every Sunday. KosherBBQ- Mesquite Grilled Chicken, Grilled Veggies from Santa Monica Kosher Market “BBQ Sundays”. Matzo ball Soup– Try wood smoking Chicken for the Broth. Grill the Carrots, Celery and even the Matzo Balls before adding with Herbs to broth. Kosher Vegan Soup Broth and Gluten Free Matzo Balls are available online and at selected Kosher Grocery Stores. Smoked Salmon– Home Smoked Salmon contains up to 80% less sodium than most store bought cured salmon. Smoked Brisket– Rather than the oven, try cooking your Brisket on the Grill to add nice smoky flavor. Pastrami- Yes pastrami! Try grilling or smoking it at home to cut down on the heavily salty and sugared brines used in store brands and certain Deli’s. Smoked Whitefish- Is much easier to smoke at home than you may think. Copy and Downloadable version of BBQ RESCUES! Foundation’s Tips for Kosher BBQ. The BBQ RESCUES! Foundation is active with Video Production and Social Media outreach to promote Fitness and Healthier Grilling, as well as other important Community Projects. Here are some Highlights of our Activities, thus far. Check back soon for Updates. BBQ RESCUES! Foundation’s Chef Mick Brown at 2017 Western Foodservice and Hospitality Expo with Jonathan Burgess of Burgess Brothers BBQ sauces. HUGS AND THANKS TO ALL VOLUNTEERS- WE COULDN’T HAVE DONE IT WITHOUT YOU!!! 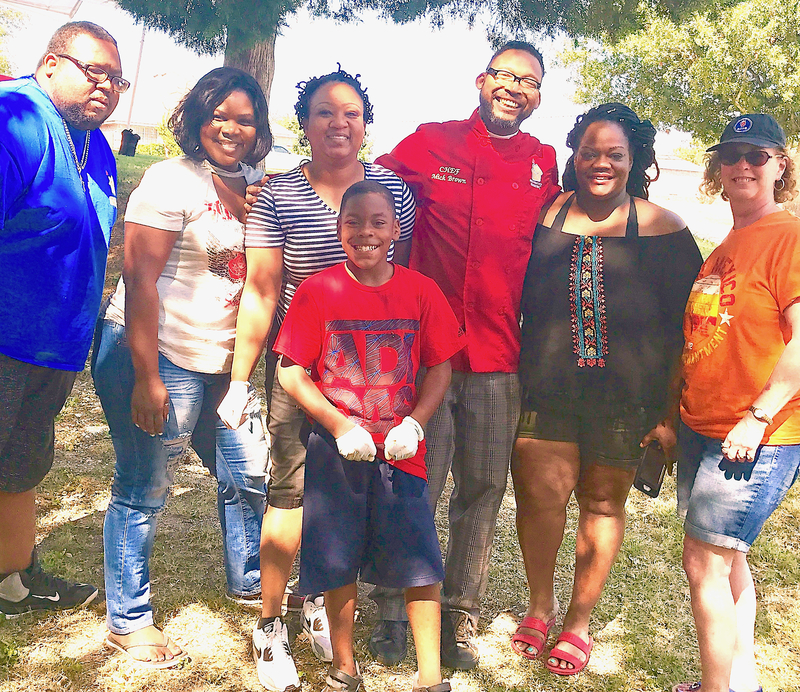 “Spotlight on BBQ RESCUES! Foundation Part III” Coming Soon. Stay Tuned! What’s This BBQ RESCUES! Thing About, Anyway? Free Subscription with Contest and Prize Updates by Email.